Ever since Skybox Imaging and then Planet Labs hit the news headlines, smallsats have been lauded as the future of the space industry, portrayed in the mainstream media as enabling novel applications, making space accessible, and delivering a new paradigm. Perception within the industry has been more mixed; however, commercial and government players alike broadly anticipated a net-positive impact from smallsats. Just over five years into the smallsat hype, the questions must be asked: is the smallsat market delivering? At first glance, the answer is a clear and resounding: No. The market is peppered with starts and stops as companies fail to hit milestones or secure sufficient capital to continue development. Of the dozens of constellations planned, only Planet has managed to launch its full quota of satellites — three years later than envisioned — while others remain in build-out or technology development phases or on the shelves. 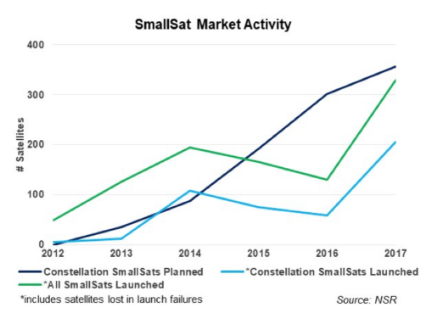 The smallsat data analytics-enabled applications promised and the distribution networks to deliver them are expanding but remain limited, their development slow to catch up to an initial focus on space segment. Smallsats remain a minor piece of the overall revenue pie for Earth Observation (3% in 2016) and are not yet on the board for IoT or voice applications, let alone the myriad of new applications promised. NSR tallied $4.3 billion of investment in the smallsat market over the last five years — while valuations have risen to offer the promise of a lucrative exit, the slow revenue generation and saturation of multiple market segments opens the door to a market bubble. Finally, the dedicated smallsat launch vehicles seen as critical to providing the flexibility for optimal smallsat deployment are not yet available. Despite strong market demand, more than 50 vehicles in development, and years of R&D, only the CASIC Kuaizhou-1A (and soon, hopefully, Rocket Lab’s Electron) is fully operational. NSR’s Small Satellite Markets, 4th Edition found that the 1 to 500 kg. market grew at an 18 percent CAGR between 2011 and 2016. While this is high growth, it has been mostly in the form of a single operator and one-off missions that have limited commercial or government/military utility. Overall, despite hundreds of satellites launched and tens of start-ups founded, realization of smallsat plans has been limited to date. Therefore, the next question that must be asked is: What has been delivered? Clearly, this activity has laid the technology and business development groundwork crucial to a broader, more mature market moving forward. Operators are closer to deployment than ever before. While only Planet has attained a fully operational constellation, players like Spire are approaching this level while 11 more have deployed technology development satellites over the past year. Signs of M&A as well as partnerships across smallsat players and with more traditional actors are budding, a step that will consolidate competition and provide a more robust marketplace. At least one western dedicated smallsat launch vehicle should reach market this year with another soon to follow, easing launch restraints. Government and military entities are considering regular smallsat data buys and inclusion of smallsat platforms in future architectures. Of course, a maturing industry does not imply success across the board — NSR fully expects additional companies to be acquired, pivot, or close in the coming years. But the market has reached the point where what had been a Wild West phase of crazy idea after crazy idea is transitioning into a more stable dynamic where innovation is grounded in market demand, follow-through and revenue generation. The market will contract in this process but will emerge stronger and more sustainable. By and large, the smallsat market has not lived up to the hype. Challenged by delays in constellation deployment, insufficient ROI, and a lack of dedicated smallsat launch vehicle availability, it is still a work in progress as ‘the future of the industry.’ The reality of new market expansion is such that this is not atypical or unexpected, and signs that the market is reaching a turning point of maturity sets the stage for more sustainable growth moving forward. Now is the time for smallsat players to perform and deliver value to end users, the investment community, and the space industry as a whole.